NEW YORK (AP) — The eight people killed in a truck driver's rampage were honored by friends and strangers with a walk down the riverfront esplanade where the victims died as both investigators and terror-weary New Yorkers tried to make sense of the crime. Some at Thursday's nighttime march carried candles as city lights twinkled on the water. 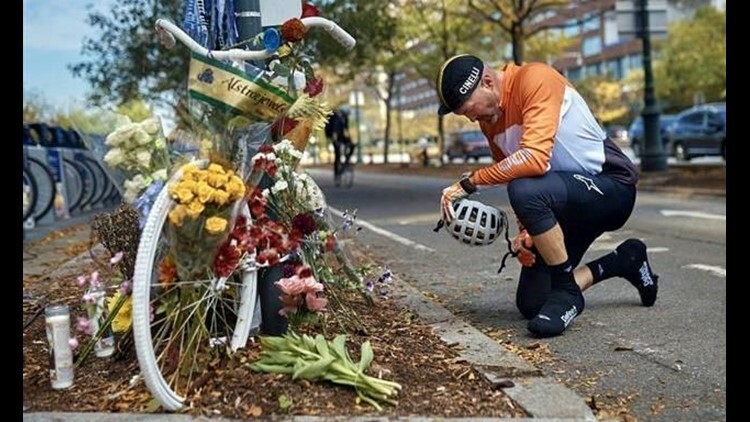 Others pushed bicycles in solidary with the victims, who were cut down on the long bike path that runs the length of Manhattan's Hudson River waterfront. "You never think it is going to be someone you know," said Kassen, 17. He said he'd just recently worked with Cleves on lighting and sound for a school performance. "We were up in the tech booth, chatting. Then, two weeks later, here we are. And he's gone," Kassen said. Two women carried the flag of Argentina, in remembrance of the five people from that country who were killed when Saipov's truck plowed into a group of friends who had come to New York together to celebrate the 30th anniversary of their high school graduation. "I think Martin had to know the truth. Maybe he already imagined that but now he knows and is a step that his friends wanted to take before returning to Argentina," Argentina's consul in New York, Mateo Estreme, told reporters in Spanish. "It was something very emotional for all of them." The New York Police Department's top counterterrorism official, John Miller, said investigators still hadn't uncovered evidence that Saipov had any accomplices in the attack, but said information was still being gathered. A propaganda arm of the Islamic State group called Saipov "a soldier of the caliphate." A message in an Islamic State weekly newspaper used the term in an item published late Thursday. That item then was translated by the SITE Intelligence Group. The Islamic State group has an interest in taking credit for attacks carried out by individuals who are self-radicalized. In their search for clues, FBI investigators have questioned Saipov's wife and some of his acquaintances, including a fellow immigrant from Uzbekistan, Mukhammadzoir Kadirov, who said he had gotten to know him when they were both Uber drivers. "It is so sad and unbelievable. This not from our religion. It is not acceptable. We as Muslims completely reject this kind of actions. No human being who has a heart can do this," the statement said. President Donald Trump tweeted out messages early Thursday calling for Saipov's execution. In a highly unusual instance of a president weighing in on the fate of a defendant awaiting trial, Trump wrote that prosecutors "Should move fast. DEATH PENALTY!" The comments could give defense attorneys grounds to argue that Trump has poisoned the minds of potential jurors, but some legal experts said they doubted judges in Manhattan's federal courts would let the president's remarks derail the case in a courthouse with a quarter-century record of swift terrorism prosecutions with mostly airtight outcomes. "Even presidents are entitled to First Amendment rights," said Michael Wildes, a former federal prosecutor. "It's inconceivable that it would be fair to seek the death penalty when the president has expressed it twice in a tweet," he said. "It poisons the jurors, all the prospective jurors." Meanwhile, Saipov's court-appointed lawyer, David Patton, said he hopes "everyone lets the judicial process play out."